View of rear face of gravestone commemorating John Scott, a tenant farmer, who died in 1752 and his wife, Jean Goodfellow, who died in 1783, Teviothead Churchyard. 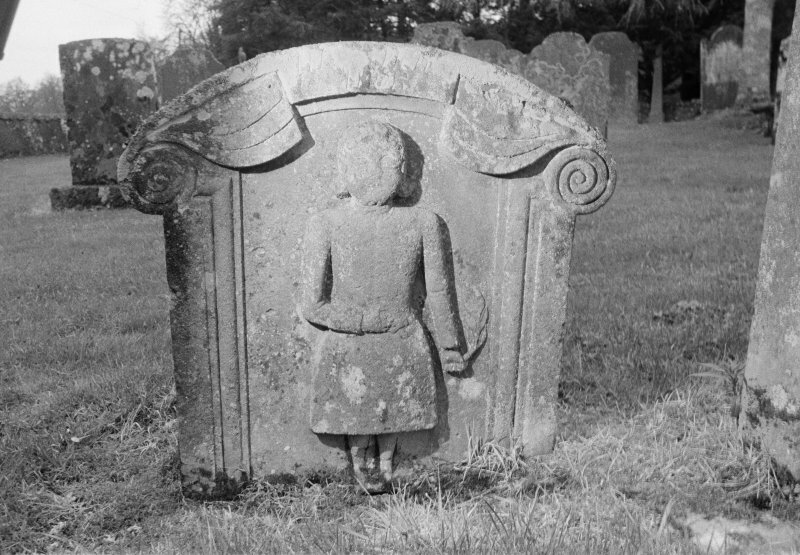 View of rear face of gravestone commemorating Mary Scott, wife to a local tenant farmer, who died in 1745, Teviothead Churchyard. 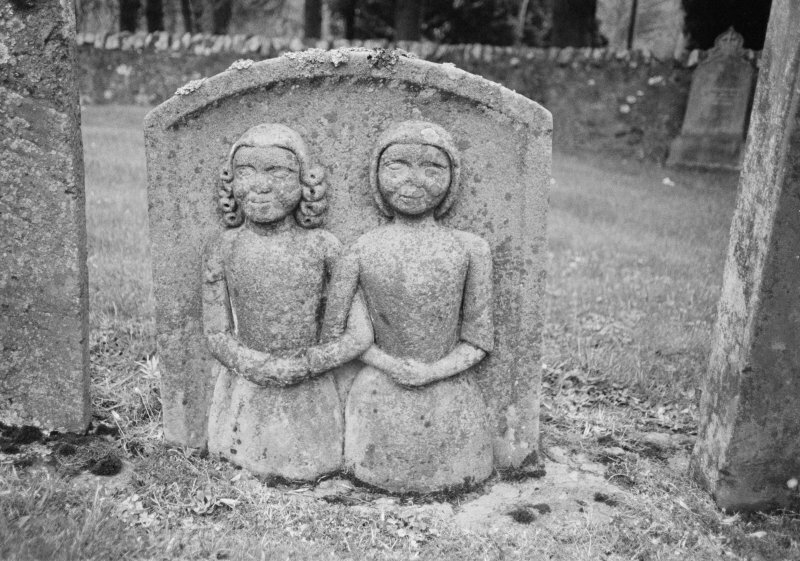 View of rear face of gravestone commemorating Adam Robson, a tenant farmer, who died in 1760 and his wife, Jean Beattie, who died in 1755, in Teviothead Churchyard. "......The ruins of this pre-Reformation chapel at Caerlinrig have long disappeared, but the foundations still remain and are situated in the centre of the old churchyard there. A number of years ago was unearthed from these foundations a sandstone slab... six feet in length....it now stands in the manse glebe.."
The chapel of Caerlanrig stood in the forkings of the Teviot and Frostylee Burn. It was dedicated to St. Mary the Virgin and was presumably erected in the 15th century (if not earlier). It does not appear on Pont's map of the Teviotdale (c.1595). The foundations were excavated by Rev. R Young who caused the 6 foot sandstone slab..."a sidepiece of a window with sculpture"..., to be removed and set up in his own field (R Young 1875). 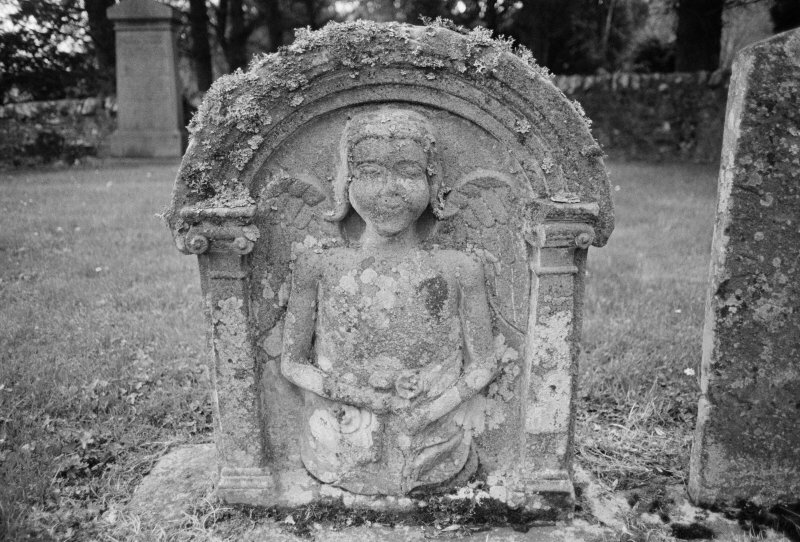 (1) A small headstone, showing a recessed panel surrounded by somewhat unusual decoration (Fig. 36) and commemorating JOHN RENWICK, who died in 1625. (2) A small headstone commemorating AGNIS PATTERSON, wife of NINIAN ELIOT. The date does not seem ever to have been cut, but the style of the lettering suggests the 17th century. (3) A small headstone commemorating ELISPET(H) WAUGH. The date has weathered away, but again the lettering suggests the 17th century. 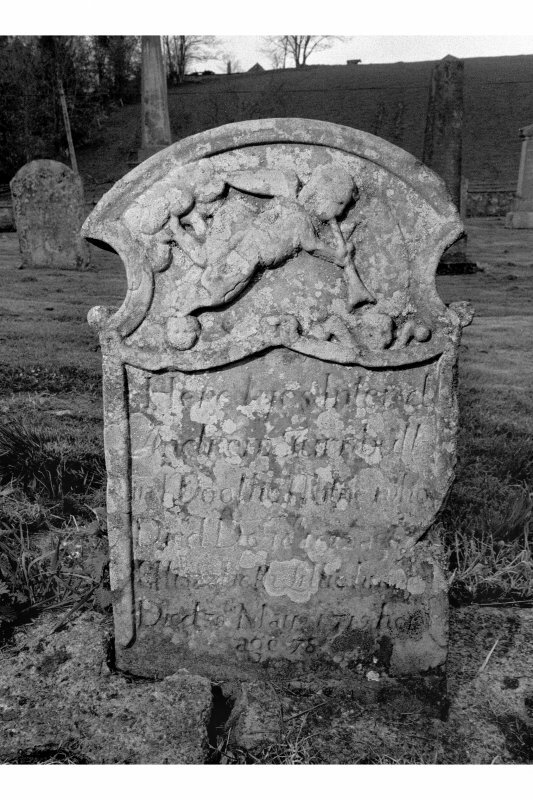 (4) A small headstone commemorating ROBERT NICOL, who died in 1699, and BESIE NICOL, who died in 1701. Above the beginning of the inscription are cut the names of JAMES NICOL and MAIRIN SCOTT; these were probably the parents of Robert and Bessie Nicol, who, having survived their children, were commemorated on a stone already erected to them. At the spot indicated, is a slight swelling in the ground the site being covered with grave stones. An archaeological assessment undertaken by GUARD of the proposed upgrading of the A7 between Dovecot Bridge and Castleweary around the village of Teviothead identified a number of archaeological sites. The current church site at NT 403 051 has three previous forebears, one inside the churchyard at NT 403 051 and one at NT 403 054 (NT40NW 9). The third is supposed by tradition to lie within the Glebe lands at NT 404 049 (NT40SW 3), however no surface remains are evident. 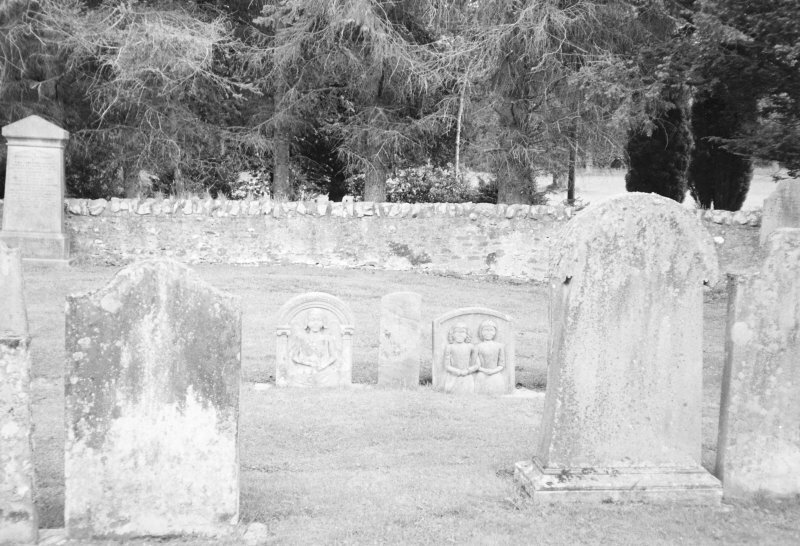 Recording of gravestones in Teviot Old Graveyard, Roxburghshire, by Mrs Betty Willsher 1986.